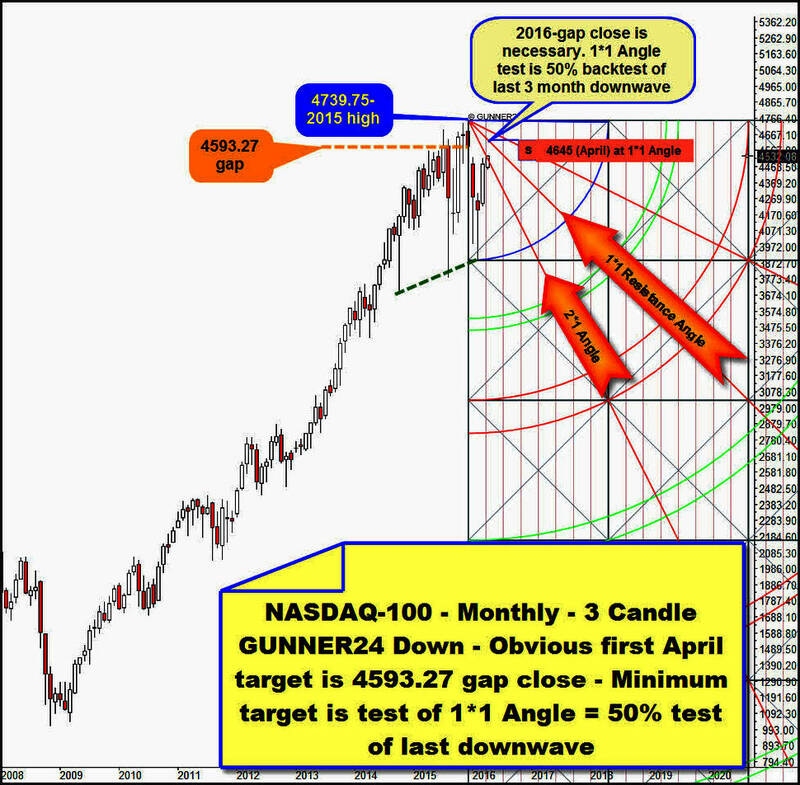 The last time I analyzed the US stock markets with the help of the NASDAQ-100 was in the March 6 issue when I presented several trigger marks and the resulting consequences to the US markets. For example, a weekly close above 4372 in the NASDAQ-100 was to be able to enforce a rally continuation to at least 4484. Furthermore – as to my assessment at that time – such a weekly close above 4372 increases most dramatically the probability for the US markets to have seen their final year lows at the February lows. 3 weeks ago, with a weekly close of 4410.83 first the important 4372 succeeded in being finally overcome. The 4372 had been important arc resistance in the yearly time frame, important resistance for the entire year 2016. Thus, another powerful upwards potential was triggered. The month of March 2016 closed then exactly at the next higher important GUNNER24 Magnet, the 4484. The NASDAQ-100 closed the month of March exactly at 4483.66. At once – with the first trading day of April – also the 4484 seems to be overcome definitely and finally. The NASDAQ-100 closed far above the 4484 resistance on Friday, exactly at 4532.08. The 4484 is likewise matter of an important resistance in the yearly time frame = again important resistance for the year 2016, now strong weekly support. Thereby, the NASDAQ-100 – AS WELL AS ALL THE OTHER IMPORTANT BROADER US STOCK MARKET INDEXES!! – has to keep on rising compellingly!!. The US stock markets have their traditionally best month of the year ahead. Since the small speculators don’t trust in the current rally keeping on adhering to unusually high short-position, the US stock markets are supposed to be able to continue rising swiftly and without many disturbing factors in April. In the chart above, we eye the index through the current correction- resp. downtrend-glasses because we applied a 3 Candle down in the monthly time frame, beginning at the final high of the year 2015. As broached above, on the very first day of the new month and quarter, the NASDAQ-100 started overcoming the important 4484 yearly resistance. 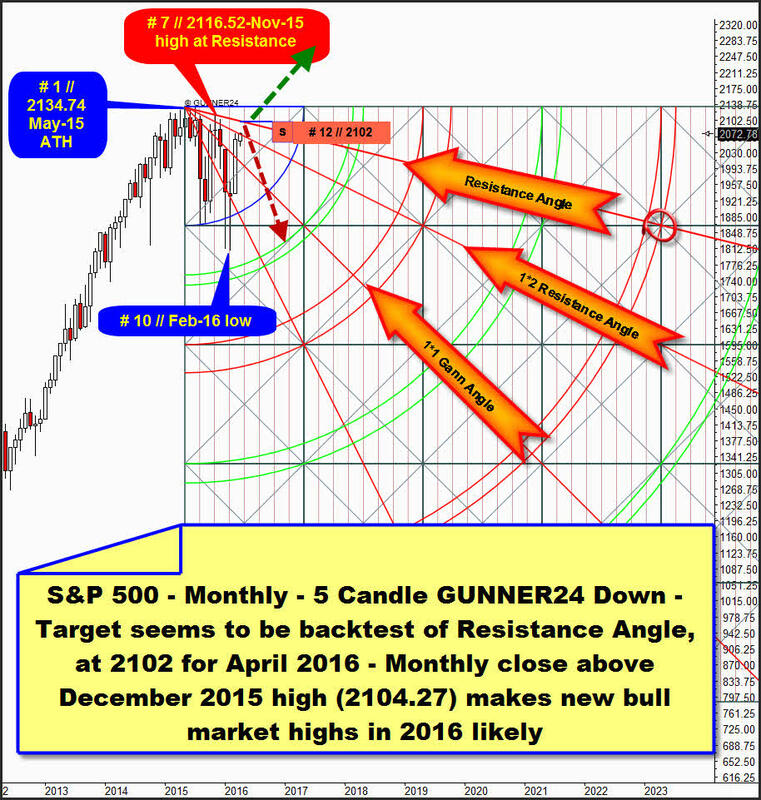 Visibly, the market is now attacking the monthly 2*1 Resistance Angle that is directly derived from the year high 2015. Last week, a weekly close above the 2*1 Resistance Angle succeeded. ==> Since the 4484 yearly resistance seems to be taken definitely being mostly broken loose very strong up-energies in case a resistance magnet in the yearly time frame is overcome, a swift and rapid rise is due now, by virtue of the sentiment, the bullish seasonality, the mighty force of the current uptrend and because a weekly close above the 2*1 Resistance Angle succeeded. In the course of the last days, Dow Jones und S&P 500 succeeded in closing their gaps on yearly opening base after all. The NASDAQ-100 will be able to follow suit now being supposed to close its open yearly gap at 4593.27 within 10 trading days at most. ==> First next shortterm uptarget for the NASDAQ-100 is the yearly gap close at 4593.27. Technically, the open gap at 4593.27 is no impediment for not rising beyond! Firstly, the Dow Jones as well as the S&P 500 and the Dow Jones Transportation Index recently overcame their respective natural yearly gap resistances without difficulties, and secondly, the monthly 2*1 Resistance Angle being currently overcome makes an approach up to the 1*1 Resistance Angle at 4645 as early as in April 2016 most likely to happen. 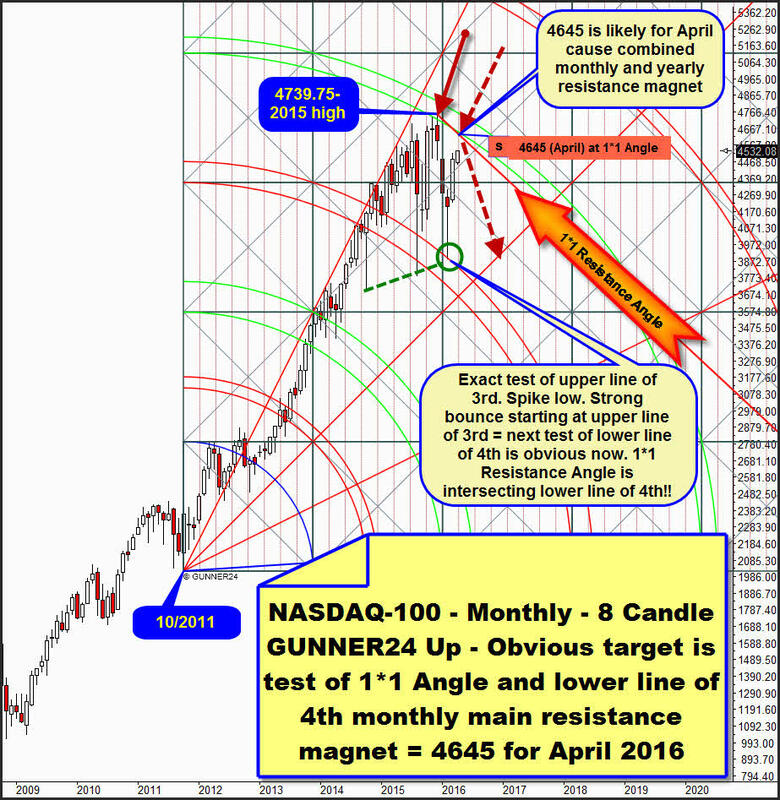 If the NASDAQ-100 reaches the 1*1 Resistance Angle at 4645 in April 2016, it would have corrected the last 3 month correction move ensuing from the year high 2015 by not more than a 50%. This monthly up setup begins at the October low of the year 2011 measuring upwards the first 8 month up impulse starting from this low. I begin the analysis at the year high 2015 that was made exactly at the predicted important resistance and monthly uptarget of the lower line of the 4th double arc resistance. The hit with the lower line of the 4th double arc resistance made the market fall resp. correct, indeed quite exactly down to the upper line of the 3rd support. There, at the upper line of the 3rd and at the important next higher February 2016 uptrend low, a backtest of the previously upwards-broken 3rd double arc took place – at the green oval. Thereby, the 3rd newly acted as extremely strong support magnet at the February 2016 spike low. The February 2016 low spiked exactly onto the upper line of the 3rd double arc. This test seems to have released enough upwards energy so the lower line of the 4th = main resistance for 2016 will have to be headed for and tested again now!! In merely optic terms, the index is just close before reaching this double arc resistance line that seems to be headed for compellingly. As if it were coincidental, the 1*1 Resistance Angle being the natural important Gann Angle that ensues from the year high 2015, intersects the lower line of the 4th resistance, thus together with the lower line of the 4th forming the next higher important resistance magnet on yearly base. ==> I think, this resistance magnet in yearly time frame will possibly be reached at 4645 as early as in April 2016. Since in May mostly the weaker phase of the year begins, then the index is supposed to start newly a several week downwards move that is technically likely to last till September 2016 and to lead to a serious test of the February 2016 low environment. However bears: A monthly NASDAQ-100 close above 4700 either in April or in May will keep on chasing the market upwards. It would be a mighty next buy signal in the monthly time frame. As well for all the other broader US stock market indexes, the result would be new bull market highs and new alltime highs. I still cling to my opinion that technically the US stock markets can only be in a correction move. Even though the Dow Jones as well as the S&P 500 would be considered to come pretty close to their respective alltime highs achieved in 2015 in case the current rally ends up in April in order to test then at least the February 2016 lows seriously in the further course – or perhaps even fall below. The S&P 500 is still the determining benchmark index for all the chart technicians, wavers, cyclic masters etc. Well, since this index – unlike Dow Jones and NASDAQ-100 – reached a first lower low in February, some analysts are working on the assumption that the US stock bull market came to an end at the 2134.74 alltime high marked on 05/20/2015, the US markets falling deep now and over the next years. It’s an allowable assessment, a first lower low at the S&P 500 is a serious indication to such a powerful US stock market decline. Now that this assessment and forecast don’t work either in terms of price or time and the general bear market thesis seems to be in extreme danger because the market wants to go even higher now… it seems so at least in the short term…!! I can only determine the price and the time triggers, where and from which moment things become really tight for all the "shorties". We’re talking about a monthly S&P 500 close above 2104.27 for April resp. May 2016. That’s where the presently last resistance is before some new alltime highs should have to be due!! 2104.27 is the Maginot Line of the bears. 2104.27 was the December 2015 close. Now I think that the market wants to deliver an important lower correction high, either in the 12th month (1 year cycle) of the correction or in the 13th month (important Fib number) of the correction at the Resistance Angle. Let me explain that thesis: the correction count starts at the high of # 1 = May 2015 = alltime high (=ATH), the first down impulse ended at the low of # 5. Fake low at the February 2016 low, # 10, and a next lower important high should likely be due for the month of April 2016, the 12th month resp. May 2016, the 13th month of the current correction. At the Resistance Angle, the important lower 2116.52-November 2015 countertrend high was pinpoint reached. Since also the S&P 500 gets ready to overcome its important 1*2 Resistance Angle, the index – supported by the very positive April seasonality and the wrong positioning of the small specs – should cope with accomplishing another test of the Resistance Angle. ==> So, next target for the S&P 500 is the anchored Resistance Angle at 2102 pts. for April 2016! Technically, that’s where the current recuperation of the correction move should come to an end, in succession the index diving from there in order to test back then – at least - the 1800 support area again then. However, if either in April of May a monthly close above the Resistance Angle and therewith above the December 2015 closing price succeeds = monthly close above 2104.27, an upwards melt-up move up to the 2250 resistance magnet should be the result!